As long as I wouldn’t have to pay for the repairs, it looks like fun to experience ! It was fun at the time, with little bits of practicality/fear mixed in (“ooh, I’ve never seen tree branches moving like that before. Um, maybe I shouldn’t be standing right beneath them”). Dealing with the aftermath has been less fun, but there are still tree branches in random places on the streets/sidewalks/lawns whenever I need a dose of surrealism. 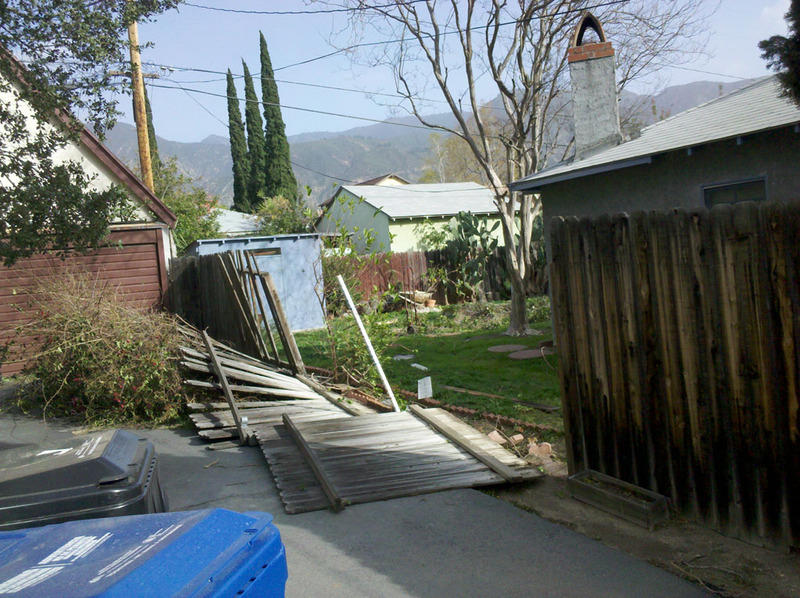 My fence looks like that fence, and we haven’t even had a wind storm. The next time I build a fence, I think I’ll add some of those things called “posts”. What I want is something that has most of the properties of a chain-link fence (will keep my neighbor’s dog in, is see-through, won’t get knocked over by wind) but that looks a lot nicer. #7 is quite a drawback for any mathematician. Imagine happily differentiating along your fence, and then that! You can still integrate, though. Apparently the area under my fence is less than it used to be. Wake up in Oz? Are you planning a trip to Australia? I want to pick up a heart and a brain while I’m there, but I’m not sure I’ll be able to get them back through Customs. Customs won’t care as much as USDA will. Then I’m doomed. I’m powerless to resist those adorable USDA beagles. I can’t even imagine what the Santa Ana winds must have been like – probably very much like a typhoon without the rain. I’m going to go check out some videos about it. One thing that was really frustrating is that there wasn’t enough light for me to get video of anything on my phone (and in fact, I have a bunch of solid-black videos that I took, hoping that the video fairy would somehow come and fix them during the night). Digital still photos are easy to brighten in a program named Irfanview. For video, my only idea is to upload it to youtube. Youtube is has video editing software. Robert Frost must have been talking about this when he wrote “Something there is that does not love a wall”. Is the damage on the 4th piece from the right? It’s darker than it’s neighbors. That’s the damaged one, I can tell. I had to google that poem because I wasn’t familiar with it. I really like it — thanks for introducing me to it. and if that wasn’t enough trouble, now comes the dealings with insurance companies! You have a clever way of relating information and observations. Hope next week is better for you. I’ve been procrastinating calling the insurance company (and the roofer), but I really need to do that today. You know you’ve had a good wind storm when even Wyomingites – who are used to sustained winds of up to 80 mph – are impressed. I feel for you. I hope they get the power back to everyone soon. And I really wish I was an insurance agent this year. I woke up at 4:30 this morning and noticed that a) I wasn’t cold, and b) I could hear the sound of the central-heat fan. Then I went back to sleep. I love that movie, but it’s always bothered me that the Toto / Miss Gulch situation was never resolved. The producers felt their original ending where Toto gets muzzled and led off to the pound kind of put a damper on that whole “there’s no place like home” vibe. Someone should really make that version. It would put the universe back in balance after the “love conquers all” version of Brazil. I was still laughing at this when I woke up this morning. Fine. Just breeze in here with your puns. See if I care. It could have been worse, Laura. You could still be locked in the bathroom and have missed everything! With the heat out, I’d have taken a multi-day hot bath to stay warm. By the time I was rescued, I’d be wrinkled beyond recognition. Pingback: We’re in this together! | Me! Me! Me me me! Looks bad! Glad your roof wasn’t blown off though. Love your kitty pic. Ouch..glad you’re okay. We had strong winds over here yesterday evening..not as strong as yours, but enough for the trees to do that frantic dance you listed and loosing a few pounds by losing a few branches as well. ! I printed this out and put it next to my emergency tidal wave and tornado information. Thanks! not exactly the gentle tropical breezes you see in Corona commercials! (Glad to hear your power is back on – it’s easy to forget how much everyone relies on it until it goes away for a while)!